As-Suffa Outreach Homeless caters for the local and wider community in the UK. We provide support and services for the vulnerable, most needy and the young irrespective of background. Staged in partnership with Sheffield City Council, this 10K has a fantastic course right through the heart of the Steel city. 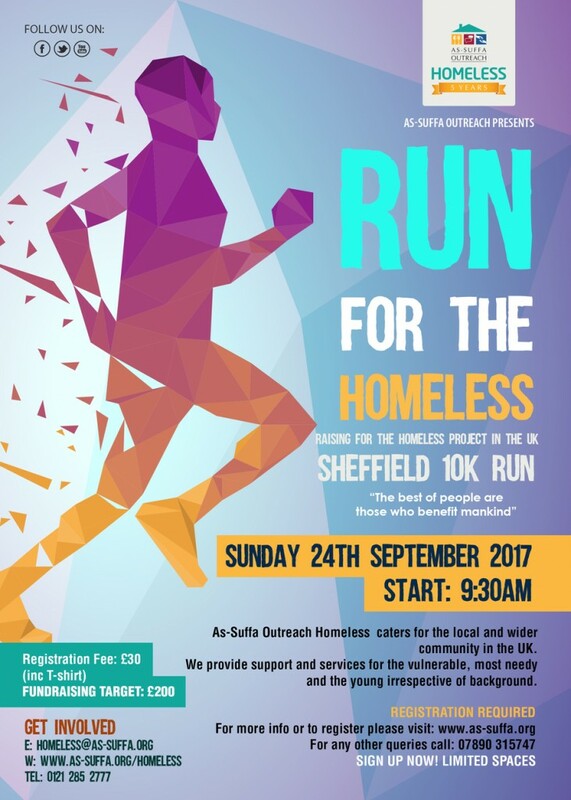 Register today and RUN for the HOMELESS through Sheffield. Raising money for the Homeless Project is a big part of the experience for many runners and this year we have set a target of £200 each. This will go a long way in helping fight poverty locally! Once you have registered please set up a JustGiving page to get your fundraising started. Start by clicking here: http://www.as-suffa.org/sheffield-10k-fundraising-page/ and then click on ‘Start Fundraising’. Note: The charity name is As-Suffa Trust (charity no: 1106270) and the event is Sheffield 10K 2017.